32 ' x 72" x 30"
The final part of the installation is a bench/vitrine/museum case. 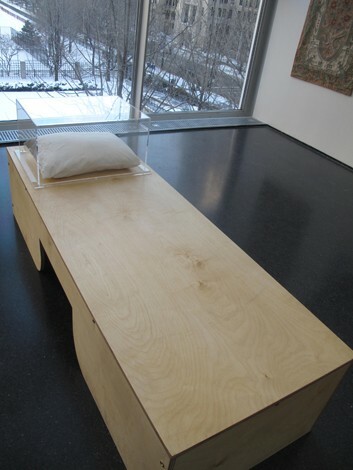 The functional bench is constructed like the old-fashioned cases one might find in a natural history museum, and designed based on photos of Freuds actual couch. At one end, a plexiglass vitrine contains a stained pillowsignaling a parallel between the way that our dreams are captured and offered for analysis, interpretation and meaning, and the way archeological objects, which Freud collected, are displayed under glass.